WOW!!! What a beautiful ball. I must make one soon. quilling. I am going to enjoy making a lot of creations. Spotlight have them or similar, but they may not have them until closer to Christmas. Thanks Bronwyn! I don't usually shop at spotlight, I must confess as it is a bit 'out of the way' up here, it is a fair distance from home and it can be a bit of a maze to get in and out sometimes, but I will definately stop by and have a look see what they have and enquire about the balls. Do you know if they do other shapes as well? Or are they just round? Just curious as I am looking for a small (quail sized) egg shape to make a bird with, just to shape the paper. I want to make a couple of white doves to sit inside my heart I have made. I will look and see then too. Thanks again, sorry about the tangent in thoughts above... Have a fabulous weekend! I have seen star shapes in the clear ornaments. Egg shapes usually appear close to Easter. Fabulous! Thanks for this info Bronwyn. I will definately check out that web site and also spot light when I go for shapes... Thanks for this I appreciate it! I went to Polly's beads web site and had a look, and they have a divisable egg shapes and balls and heaps of other useful things that would be good! Awesome! I purchased a couple of balls and can't wait to get started for Christmas decorations. I do hope I can find some of these balls in Canada. I know I have seen them a few years ago and of course I didn't buy any at the time. That would have been too easy! These would make nice Christmas presents for my friends who like things that are handmade so I think I will start making some circles and shapes to have them ready once I find some balls. 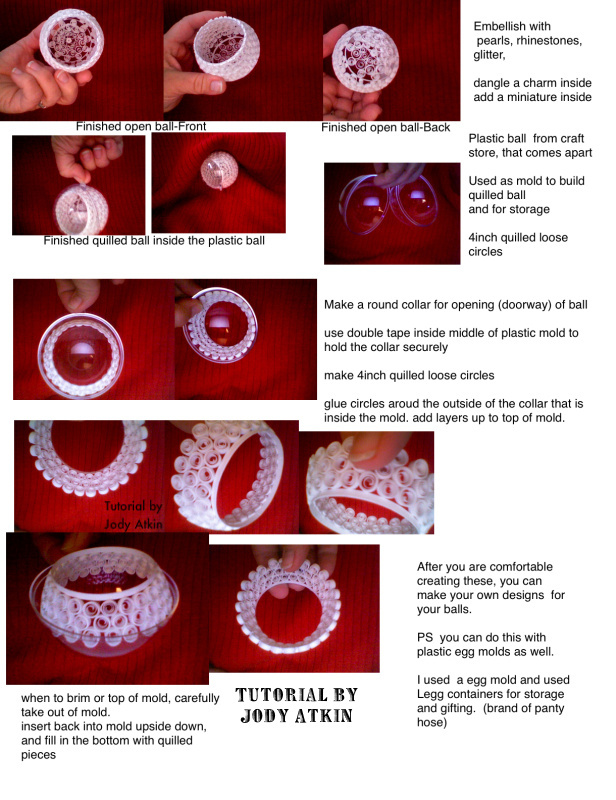 I wonder what it would look like if I took a clear glass ball, (I know I have those) and covered it with quilling overtop. I'm not sure I would be as happy with it though. I am sure you will have fun planning your quilled Christmas gifts.